Interactive: How does your state rate? ATLANTA, Georgia (Reuters) -- There was nothing for the older folk of Appalachia to smile about after the government released its latest study of toothlessness among the elderly, which found the region leading the nation in tooth-loss. Kentucky and West Virginia have the highest percentage of older adults missing all their natural teeth according to data collected in 2002 by the Centers for Disease Control and Prevention. Slightly more than 42 percent of residents 65 and older in Kentucky could make that dubious claim last year. West Virginians were a close second with 41.9 percent of seniors admitting they had shed their natural choppers. In both states, older adults who were naturally toothless outnumbered those who could say they had lost five or fewer of their natural teeth. Although the study did not focus on the root causes of toothlessness in the states, researchers said they suspected a combination of economic, cultural and medical factors were responsible for wide variances in state results. "We would imagine it probably reflects the impact of health behaviors such as smoking and oral hygiene practices and also socio-economic status in terms of income and education," said Dr. Barbara Gooch, a CDC dental officer and the study's lead author. 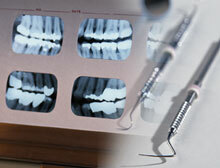 Western states tended to score much better on the tooth retention scale last year. Utah was tops with almost 64 percent of seniors living with most of their natural teeth, while about 60 percent in California and Colorado could say the same. Overall, more than half of older adults in 26 states had most of their natural teeth last year, a finding in line with past survey that have noted a substantial drop in older adult toothlessness since the 1950s. Researchers said the current crop of American seniors had likely benefited from the fluoridation of water, advancements in dental care and other oral hygiene measures introduced in the past 50 years. But they also said that increased tooth retention meant that many would remain at risk for tooth decay and periodontal disease, highlighting a need for community-based programs that stressed healthy dental care.